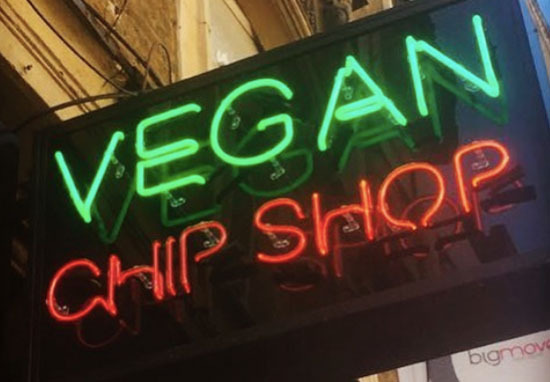 A chippy in London has made the British classic available to vegans by opening the city’s first meat, fish and dairy-free fish and chip shop. Daniel Sutton opened the Hackney-based restaurant this week following the high demand he found for vegan items on the chippy’s menu. 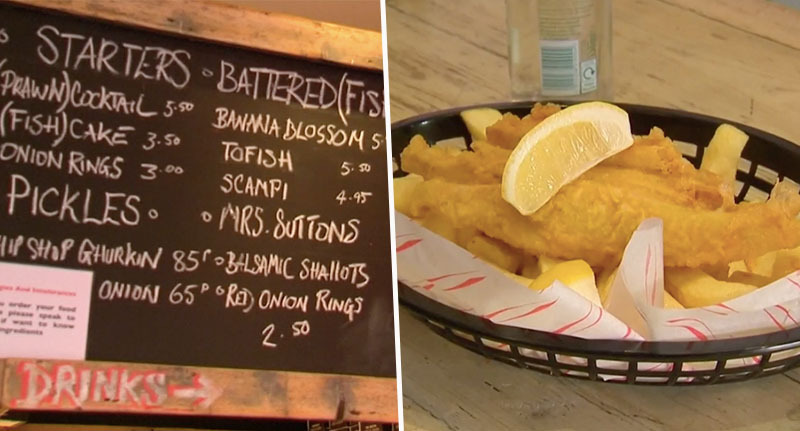 The chip shop owner began serving vegan ‘fish’ and chips at one of his east London restaurants earlier this year as an experiment and was surprised by the success of the items. Daniel’s vegan fish is made from banana blossom, which is marinated in seaweed and a sea plant called samphire to give it a fish-like taste, before being covered in flour and batter and then deep fried – as only the best chippy meals are. We thought we’d produce something vegan and see how it goes. It went really well, so we introduced a full menu. The entire kitchen at the new location will be meat and dairy free, making the whole shop 100 per cent vegan. Though that doesn’t mean you won’t still be able to order chip shop classics, as Daniel’s vegan menu also includes meat-free sausages, pies, burgers and scampi. The restaurant’s scampi is made of Japanese potato starch, which is battered and served as the prawn-like dish. The innovative owner explained the demand was clearly there for the vegan items, so he was going to deliver. It’s tough out there on the high street, and if people want vegan fish and chips, I’ll supply it. The branch did a trial run of their new shop on Monday (October 1), where intrigued customers made up of vegans, vegetarians and meat eaters turned up to try the meat-free meals. I don’t think it tastes like fish, but I’d definitely eat it more. It tastes healthier than fish and chips, and is still good fried food that you could eat on a hangover. Daniel admitted that he wasn’t sure what kind of profit he’d see on the restaurant, as he explained vegan-friendly ingredients don’t come cheap. However he justified the cost by saying vegan products ‘are good, and they’re not full of E numbers, and for that you pay a premium’. The vegan friendly shop charges £5.50 for a portion of the vegan fish. While many food lovers are excited about the new shop, others aren’t so sure. I’d definitely visit, but it feels like a lot of vegan food is becoming less healthy, with fast food places opening up and serving burgers and fish and chips. Some like the vegan menu better than fish, but other people say you just can’t beat a bit of cod. Sutton and Sons ‘fish’ and chip shop officially opens its doors today (October 4)!